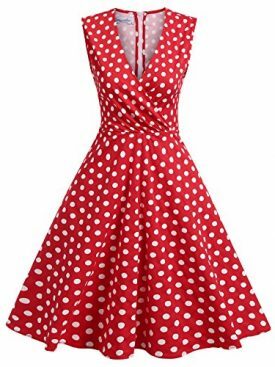 The demands for the polka dot dresses were at the peak during the mid twentieth century. These dresses had made girls and women look beautiful, attractive, and very appealing. Today, those dresses have become the vintage polka dot dresses because nobody wears them. It was the time between the 1920s and 1960s, while the polka dot dresses were contemporary fashion. The women used to wear different styles’ dresses like large dot dresses and small dot dress with white on a colored fabric. This kind of fashion was very common during that age because the ladies used to look more youthful and trendy in such dresses. Of course, the days of these dresses have gone, but still there are resources where you can find these dresses and buy them. These dresses were reintroduced many times by the designers with some changes during every decade of the mid 20th century. You can find here how the trends changed the appearance of these dresses. The polka dot dresses were famous as the house dresses during the early 20s. Some ladies had also worn these dresses as garden dresses, if there were small dots over white fabric. The popularity of these dresses increased during the mid 20s, when the ladies started wearing them as semi formal afternoon dresses. However, these dresses never replaced the evening dresses because of their different prints and style. 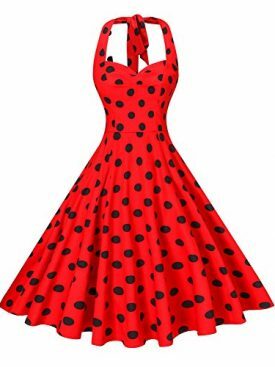 Needless to say that the popularity of polka dot dresses were increased during the 1930s, when the designers had introduced many new patterns of these dresses. It had become a pretty trim dress during the 30s and yes, their casual appeal was as it used to be during the 20s. 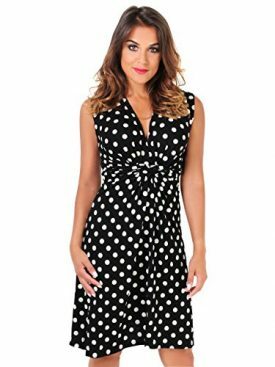 You can say that polka dot dresses had become more sophisticated during this age and even Hollywood actresses had worn these dresses. 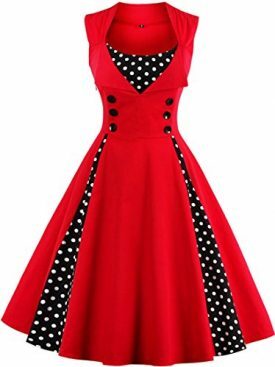 Many vintage fashion experts believe that the popularity of Vintage Polka Dot Dresses was at its peak during the 40s. It was an era when both small dots and large dots were common. In fact, many dresses were introduced with dotted prints. These dresses were available for all the girls and women, whether they were adult, aged, pregnant, or young school girls. 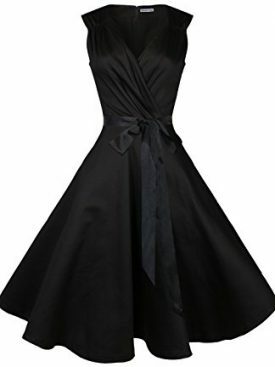 The fashion trends were changed dramatically during the 50s because it was post World War period. Everything had gotten bigger. There were big accessories, big dresses, big personalities with big skirts and big tops with shorts. The dresses with extra large dots and same size accessories had got famous during this time, and that’s what ladies had liked a lot. 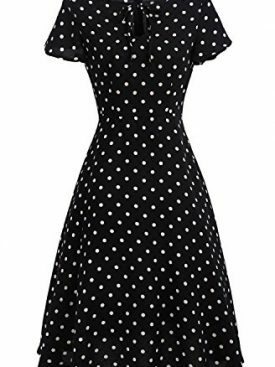 There were two famous types of the polka dot dress during the 60s. The first one was the school girl style dresses with dots. These dresses were equipped with white collars and tangled lines. Another type was the mod style. All the polka dots were no longer even. These dresses were introduced with polka dots of different sizes on the same fabric. 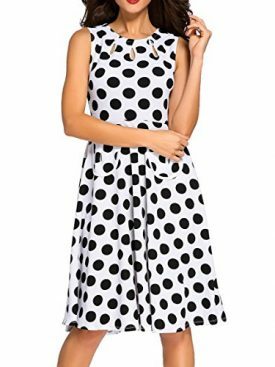 These vintage polka dot dresses had ruled the fashion industry for more than 5 decades and today also you can find some ladies wearing them because of the comfort and unique style provided with these dresses. Material : Polyester+Spandex. 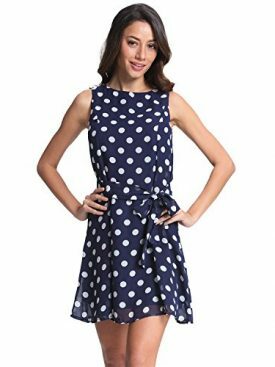 Vintage polka dotted design makes you cute and flattering. Make of quality fabric makes it more comfortable to fit in.